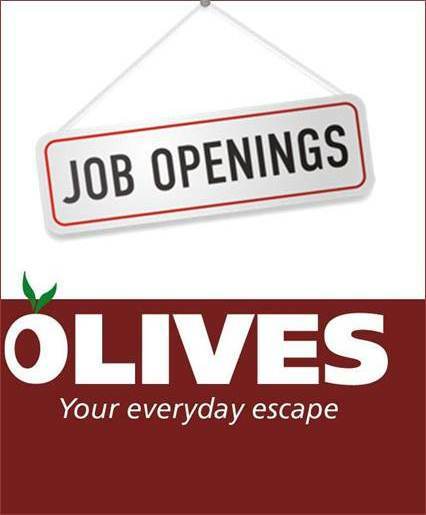 Working for OLIVES is not just a job, it is what we love to do. We pride ourselves for offering more than just delicious food. Guests are rediscovering the pleasure of enjoying fresh food and authentic bakeries made by our talented chefs at a casually elegant atmosphere and warm hospitality. Our team is among the top rated professionals in the industry who are passionate about what they do the most. If you have this passion for food & beverage, for hospitality and you would like to have a progressing career, the first step you need to take is to send your C.V. to Jobs@olivesworld.com. We are in ongoing search for the right talents to join our succesful team. So, if you are the right person, we have a place for you.